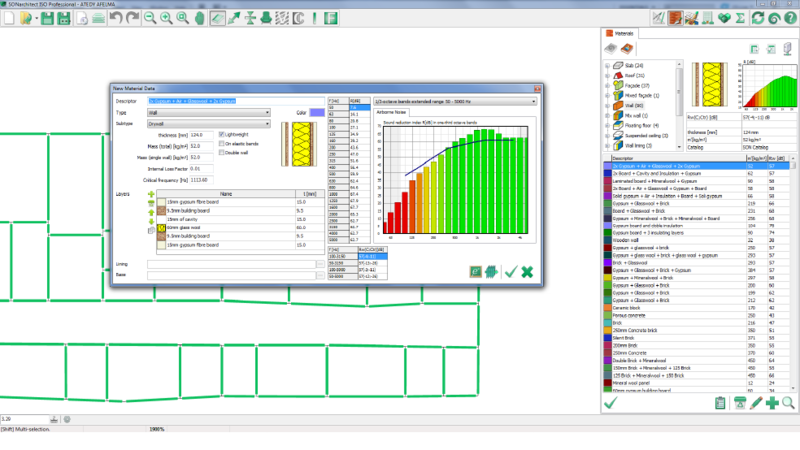 SONarchitect is the ultimate software for calculation of acoustic insulation according to EN 12354 parts 1,2,3,4 and 6 in entire buildings. 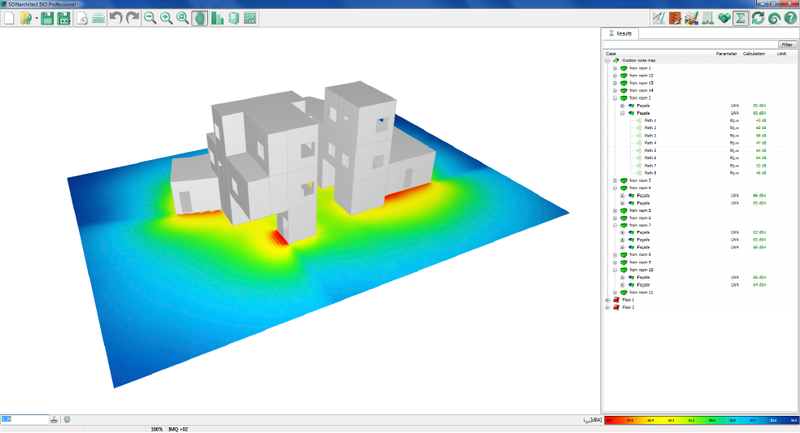 SONarchitect allows users to compute all the sound insulation values in one-third octave bands in the entire building according to EN 12354:1,2,3,4,6 (ISO 15712:1,2,3,4,6). 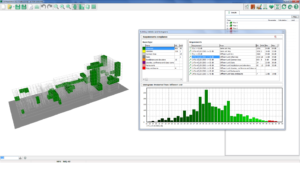 Results are detailed for every enclosure, separator, flank, and transmission path, and can be interactively explored. 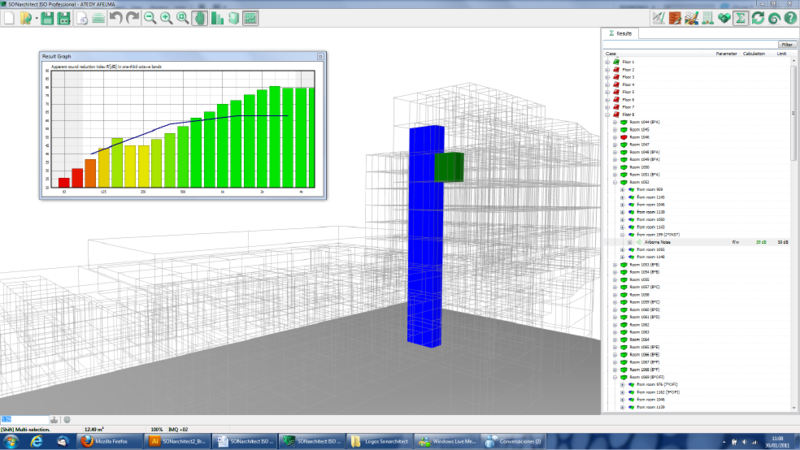 Get a subjective experience of the acoustic performance of your building with the auralisation engine, directly accessed from the result tree. Play one of the built-in tracks or your own recordings in any room of your choice and hear how they would sound in the adjacent rooms compared to the emitter room. You only need a good pair of headphones. Take a walk around the 3D environment and feel the differences thanks to the binaural audio processing. Interactive detailed performance histograms are provided for every type of room pairing in the building, allowing fast access to and inspection of the sets of average, less than average, better than average, worst and best cases in the building, or the set of rooms in the building with a given level of insulation. You also get feedback on the compliance level of the rooms with respect to configurable sets of limits for the different encounter types, allowing you to check your designs against any Building Code based on the EN 12354. You can get a detailed record of the one-third octave band of any result. The records includes all the information you need to evaluate the acoustic performance of your building projects, as graphs, results, and information for every pair of enclosures, separator, flank and transmission path. 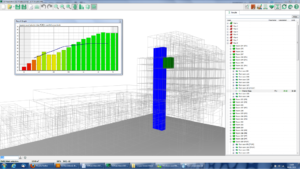 3D models created in SONarchitect ISO can be exported to the Odeon room acoustics software to design the acoustic environment of every room. 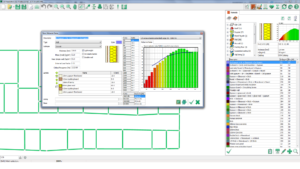 The Insul sound insulatin prediction software now offers a new feature to export results of material insulation to an XML file for ease of import into SONarchitect’s library of materials. SONarchitect also allows the import of DXF files as a template to draw plans from a CAD project. Print the results you want and the way you want. SONarchitect provides a ﬂexible report generator. 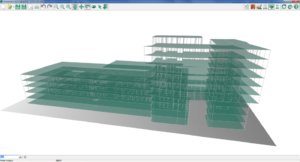 Add your enterprise logo, select a cover image with the 3D model of your building, get a bill of quantities for your budget estimation, include a compliance statement, show the quality calassification of your building, or provide details of every computation result including components and transmission paths. You can select individual rooms or let SONarchitect select only the worst cases.